Bon Bravour, dark bay KWPN Stallion, by (Painted Black / Chronos) born in 2006, standing approximately 16.3 1/2 hands. Till now this interestingly bred Dutchman has celebrated a text book stallion career. Modern in type, elegant and athletic with three first class paces. Outstanding elasticity, natural rhythm and cadence join together with extraordinary ride-ability and a willing temperament, that surely mark the beginnings of a fascinating career. These qualities had his current rider Tom Francx-Goen (Belgium) already convinced as a four year old when he was victorious at the Stallion shows in Hengelo and Roosendahl. As a five year old he repeated this victory before finishing in third place in the final qualification for the World Championships and consequently qualifying for the final. Here he went on to secure a commendable fifth place. As if that wasn't enough Bon Bravour was reserve champion in the KWPN-PAVO Cup, champion of the Belgian championships and was the recipient of the prestigious 'Pokal von Belgien' (Trophy of Belgium). It begged the question, what else can this young stallion accomplish? As a six year old he reigned supreme winning all five qualifiers for the World Championships. This dream however had to remain unfulfilled as injury forced him to withdraw and thus unable to perform in the final. 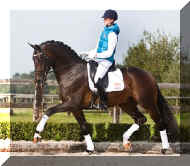 Bon Bravour's sire 'Painted Black' was a successful Grand Prix horse under Anky van Grunsven and on continuing this success with his new rider, Spaniard Morgan Barbacon, has earned himself a reputation as one of the top international dressage horses. As a son of the highly acclaimed trakhener champion, Gribaldi ridden by Edward Gal, Painted Black is half Brother to Totilas. His dam 'Kur Preferente Odette' also presents a valuable bloodline. 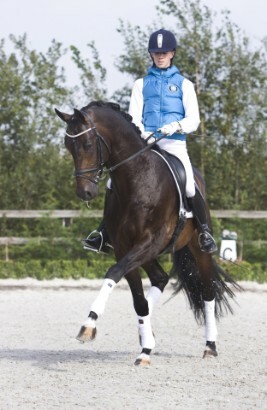 She was in her time champion of her grading, area Noord-Brabant, and went on to compete successfully in the higher levels of dressage. From this dam line stem numerous horses that have gone on to be successful in the higher levels (PSG and above). To name a few, the internationally successful Grand Prix horse Joy, international Show Jumpers Valent, Viking and Ralarnike, not to mention many licensed stallions. To conclude, the dams sire Chronus competed international Grand Prix under Anne van Olst. Through our successful collaboration with I.P.S Horsegroup over the past year it is with pleasure that we are able to offer this highly successful athlete, with an exquisite Grand Prix pedigree, once again.